The mysterious woman wielding Mjolnir may be getting the most attention, but this week is packed with major new series including Becky Cloonan's Gotham Academy, a new Mercy Thomson adventure, Darth Maul's final story, and so much more! Armor Hunters: Aftermath #1 (Valiant) — "X-O Manowar, Unity, Bloodshot, The Harbinger Renegades and many more forge a new frontline of defense for the people of Earth!" Robert Venditti (W), Cafu (A). Brides of Helheim #1 (Oni) — Cursed to roam the land as a draugr, the undead warrior Rikard is tasked with battling the demon beat named Morovig. Cullen Bunn (W), Joëlle Jones (A). Bucky Barnes: The Winter Soldier #1 (Marvel) — Bucky recovers from the events of Original Sin. Jason Aaron (W), Jason Latour (A). Critical Hit #1 (Black Mask) — Liberator's Jeanette and Sara hunt down a group of hunters, only to become the hunted themselves. Matt Miner (W), Jonathan Brandon Sawyer (A). Cutter #1 (Image) — Bullied mercilessly as a youth, the serial killer nicknamed the Cutter returns to settle old scores. Robert Place Napton, Seamus Fahey (W), Chris Dibari (A). The Damnation of Charlie Wormwood #1 (Dynamite) — When his son becomes ill, a man uses his job teaching inmates to find a solution — but how far will he go? Christina Blanch and Chris Carr (W), Chee (A). Dash #1 (Northwest) — A mysterious woman, a 1940s private detective and his lover Johnny are connected by a strange series of murders. Dave Ebersole (W), Delia Gable (A). Fiction Squad #1 (Boom) — A detective from a mystery book that never got finished tries to solve the many gruesome murder of the fairy tale land known as the City of Rimes. Paul Jenkins (W), Ramon Bachs (A). The Flash: Season Zero #1 (DC) — Barry Allen tries to keep Central City safe as a crime scene investigator in this prequel to the new CW TV series. Andrew Kreisberg (W), Phil Hester and Eric Gapstur (A). Gotham Academy #1 (DC) — Mysteries abound in Gotham City's most prestigious — and perhaps most dangerous — prep school. Becky Cloonan and Brendan Fletcher (W), Karl Kerschl (A). Green Lantern: New Gods: God Head #1 (DC) — Determined to break through the Source Wall containing the universe, the Highfather collects power rings of all seven colors. Robert Venditti and various (W), Pete Woods and various (A). Guardians 3000 #1 (Marvel) — "The original Guardians of the Galaxy — Vance Astro, Yondu, Martinex, Starhawk and Charlie-27 — try to save the future universe from the menace of the Badoon." Dan Abnett (W), Gerardo Sandoval (A). Holmes Vs. Houdini #1 (Dynamite) — The detective and the escape artist must team-up to stop a murderer determined to ruin Houdini's career. Anthony Del and Conor McCreery (W), Carlos Furuzono (A). Last Born #1 (Last Born) — When Julia falls through a rift in the space-time continuum, she discovers the Big Bang wasn't the first cosmic event of its kind — or the last. Patrick Meaney (W), Eric Zawadzki (A). Li'l Depressed Boy: Supposed to Be There Too #1 (Image) — LDB has a great girlfriend and a crappy job — and then someone from the past returns. S. Steven Struble (W), Sina Grace (A). Lobo #1 (DC) — It's a new Lobo for a new 52, but one thing remains the same — the main man leaves a trail of violence where he goes. Cullen Bunn (W), Reilly Brown (A). Masterplasty #1 (Image) — A man receives an unusual plastic surgery that causes him to change his physical appearance in all sorts of ways — both good and bad. James Harvey (W/A). Men of Wrath #1 (Marvel) — A hitman from a cursed family takes a job that will decide the fate of his family lineage forever. Jason Aaron (W), Ron Garney (A). Mercy Thompson #1 (Dynamite) — An all new story starring Patricia Thompson's beloved shape-shifting coyote stars, set in continuity and exclusive to comics! Patricia Briggs and Rik Hoskin (W), Tom Garcia (A). Plume #1 (Devil's Due) — "After returning some of the stolen artifacts, Vesper comes across some hard truth. As her father's past starts to unravel, she learns that maybe some secrets are best left untold." K. Lynn Smith (W/A). Thor #1 (Marvel) — When Thor becomes unworthy, a mysterious woman picks up Mjolnir — and it's a good thing, since frost giants are invading earth. 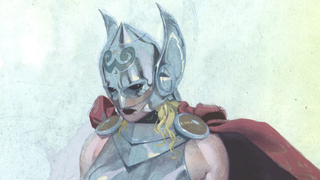 Jason Aaron (W), Russell Dauterman (A). All New Ghost Rider Vol. 1: Engines of Vengeance (Marvel) — A new spirit of vengeance battles gangs, mad scientists, and even a few supervillains with the help on his infernal hot rod. Felipe Smith (W), Tradd Moore (A). All New X-Men Vol. 1 (Marvel) — Professor X's five original X-Men are taken from the past to the present and are terrified by what they and the world have become. Brian Michael Bendis (W) Stuart Immonen and David Marquez (A). Black Metal Omnibus (Oni) — When two twins play a metal album backwards, they gain the legendary sword of Atoll and the power to fulfill their awesome, extremely metal destiny. Rick Spears (W), Chuck BB (A). Concrete Park Vol. 1: You Send Me (Dark Horse) — Earth sends all its undesirables to one planet, but will these outcasts work together or just destroy each other? Tony Puryear and Erika Alexander (W), Tony Puryear (A). Deathlok: The Demolisher Complete Collection (Marvel) — Part corpse, part computer, the undead soldier Deathlok's earliest adventures are collected. Various (W/A). Doctors (Fantagraphics) — Acclaimed cartoonist Dash Shaw's new book is "part science-fiction thriller, part family drama, part morality play for the 21st century." Dash Shaw (W/A). Edgar Allan Poe's Spirits of the Dead (Dark Horse) — All of Richard Corbin's comic adaptations of Poe's stories, including The Conqueror Worm, The Fall of the House of Usher, The Raven, The Red Death, The Murders in the Rue Morgue and more. Hip Hop Family Tree Box Set 1975-83 (Fantagraphics) — The first two volumes of Ed Piskor incredible visual history of hip hop, with a special comic book created exclusively for this release. Ed Piskor (W./A). Hospital Suite (Drawn & Quarterly) — John Porcellino's autobiographical account of the many complication that stemmed from a surgery to remove a benign tumor in 1997. John Porcellino (W/A). Injustice: Gods Among Us Year Two Vol. 1 (DC) — Superman rules the world, and only a few heroes are willing to fight him. But a new threat from beyond arrives in the shockingly excellent series based on the hit videogame. Tom Taylor (W), Bruno Redondo and various (A). Jim Henson's Musical Monsters of Turkey Hollow (Boom) — A young boy discover seven musical monsters in this comic adaptation of a lost TV special script by the legendary creator of the Muppets. Roger Langridge and Jim Henson (W), Roger Langridge (A). Laika (Square Fish) — A semi-fictionalized account of the world's first space traveler, the Russian dog known as Laika, who was sent into space in Sputnik 2 in 1957 and never returned. Nick Abadzis (W/A). Lonesome Go (Fantasgraphics) — A collection of stories starring "a sociopathic boxcar hobo, a young man who sprouts worms from his face, an undocumented immigrant bookstore doorman, a former boxer and an expert hustler all populate a haunted landscape of broken dreams." Tim Lane (W/A). Loverboys (Dark Horse) — A "loverboy" has a torrid affair with his old seventh grade teacher while three girls hatch a poisonous plot in this new masterpiece by Love and Rockets' Gilbert Hernandez. Magneto Vol. 1: Infamous (Marvel) — The former villain takes mutant-kind's protection into his own hands, determined that homo inferior will remember to fear his name. Cullen Bunn (W), Gabriel Hernandez and Javi Fernandez (A). Manhattan Projects Vol. 1 (Image) — The project that developed the atomic bomb was just a front — for weirder, more dangerous, more evil scientific breakthroughs. Jonathan Hickman (W), Nick Pitarra (A). Moon Knight Vol. 1: From Dead (Marvel) — The night's greatest detective fights the mob, ghosts, graveyard planets, and his other multiple personalities, too. Warren Ellis (W), Declan Shalvey (A). Nailbiter Vol. 1: There Will Be Blood (Image) — NSA Agent Nicholas Finchteams up with a serial killer to find his friends in a town known for birthing serial killers. Joshua Williamson (W), Mike Henderson (A). The Power of Tank Girl Omnibus (Titan) — Collecting the all reasonably insane adventures The Gifting,Visions of Booga, and The Royal Escape. Alan Martin (W), Rufus Dayglo and Ashley Wood (A). Puck: What Fools These Mortals Be (IDW) — 40 years of Puck, the biggest and most important political cartoon in U.S. history. Michael Alexander Kahn and Richard Samuel West (W), various (A). Sing No Evil (Abrams Comicarts) — In a city where bands are the only protection against supernatural threats, a singer-guitarist may hold the key to salvation — if he doesn't get eaten by his literal bear of a drummer first. JP Ahonen (W), KP Alare (A). Skandalon (Arsenal Pulp) — A rock icon falls from grace in this new graphic novel by the author of the award-winning Blue Is the Warmest Color. Julie Maroh (W/A). Southern Bastards Vol. 1: There Was a Man (Image) — One man and one stick versus one small Southern town full of many, many bastards. Jason Aaron (W), Jason Latour (A). Star Wars: Darth Maul: So of Dathomir (Dark Horse) — Darth Maul forms an alliance of the Hutts, Black Sun, the Mandalorians, and the fearsome Nightbrothers and declares war on Darth Sidious and the Sith. Jeremy Barlow (W), Juan Frigeri and Mauro Vargas (A).